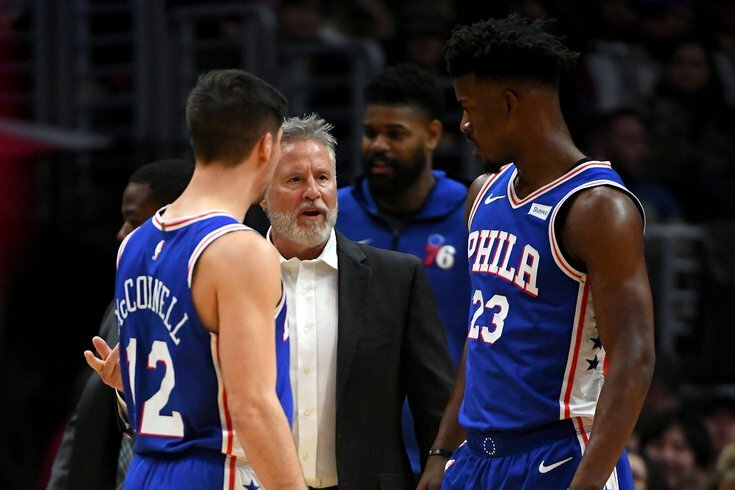 Brett Brown talks to Jimmy Butler and T.J. McConnell. With their trade for Tobias Harris, the Sixers have created a base of high-end talent that can compete with any team in the league. The question left for Elton Brand and Brett Brown is how they take that group and maximize their talents, all while keeping the respective stars happy. A lot of people love to scream about a coach's rotations, and before we get to see how they play out in real time, now's our chance to imagine what the world will look like. In some respects, the dream is often more fun than the reality. Some helpful signposts for those who don't scrutinize Brown's minutes that closely: the first wave of subs typically comes around the seven-minute mark of the first quarter, sending at least Joel Embiid and JJ Redick to the bench. Those two tend to return with about three minutes left in the quarter, play through the first few minutes of the second, and then snag a few more minutes of rest before closing out the half. Ben Simmons buoys the intermediate groups, with various players shuffling in and out to accommodate around him. Because the Sixers lost three guys in the present-day rotation, this is a lot of guesswork. But let's have some fun. This is the easiest one to count on by far. It's immediately one of the most talented starting fives in all of basketball, and one that presents matchup issues for every non-Warriors team in the league. The only concern at the moment is how this group will deal with smaller guards, who have made their life miserable for most of this season. The Sixers should be able to punish them at the other end with their size and skill, but it's a question that remains all the same. Here's where we have our first dividing point. How do you build out the subsequent units? Let's look at the repercussions of different options, keeping in mind that these are just basic outlines that will change based on health, availability, and all sorts of other factors. This route builds on the two-man combo of Embiid and Butler that Brett Brown has prioritized so far, gives Butler minutes where he gets to run the offense, and provides a proper sidekick for lineups where Simmons previously had to try to carry the team by himself. One of the issues with the Butler experiment at point guard is that it left Simmons exposed. Because he doesn't have scoring juice in isolation, opponents could shut down Simmons & bench mob lineups if they could just fluster Simmons and prevent him from getting out in transition. Harris' presence changes the equation. He can initiate sets for Philadelphia, will be the best shooter on the court, and put another switchable athlete on the floor to help on the defensive end. Harris can handle enough that you can run some interesting sets built around this duo. The Sixers have unleashed Simmons more as a rim-running forward lately, and Harris has enough shooting versatility to make teams pay if they make the wrong decision defending a pick-and-roll with Simmons screening. That pairing will hit the bench, replaced by a three-man unit of Embiid-Butler-Redick. That trio has a +15.0 NETRTG when on the floor together this season, per the NBA's stats database. Mike Scott steps into the role of Mike Muscala as the stretch four, and Scott has been five percent better from deep than the man he's replacing, albeit on lower volume. They are built to succeed and succeed at high levels. Live NBA trade deadline rumors: Any moves left for Sixers after Tobias Harris trade? Furkan Korkmaz will likely take one of the bench wing spots in the immediate term unless the Sixers make another trade and/or buyout acquisition, and that's not a great option with his defensive limitations. T.J. McConnell's role in this group would be interesting — with one less spot in the lineup to worry about, where does he continue to get minutes? Brown keeps going back to lineups with McConnell and Simmons in them, but it's hard to say whether that's out of true preference or what the coach feels is a necessity. This is an eight-man group including the wild card option still to be chosen. If the Sixers go this route, guard depth should probably be their priority, so that they can flex out of Butler at point guard/give the team another handler on the floor in the event that look doesn't go as well as they hope. This is a route the Sixers could take if they don't feel the Butler at point guard experiment is worth taking and/or strike out on corresponding deadline moves. It's perhaps more risk-averse, but it makes sense on paper. Simmons and Butler, in the minutes they've played together this season, have been productive, and with Scott's shooting and Bolden's injection of athleticism up front, the Sixers would have a run-and-gun group that can at least score in bunches against other second units. Rather than building around the Embiid-Butler-Redick trio, you would lean into an Embiid-Harris-Redick partnership, which has plenty of potential on its own. Harris is a flexible enough player that he could run some dynamite two-man game with Embiid, whether that amounts to pick-and-rolls, handoffs, or using their action to distract from Redick coming off of weakside screens on the other side of the court. One problem here is that you may not have enough trustworthy ball handling on the floor. Harris has been excellent running sets of all sorts in Los Angeles this season, but he has played with a stable of guards who could be trusted with the ball in their hands, from Lou Williams to Patrick Beverly to Shai Gilgeous-Alexander. It would put a bit of pressure on McConnell to initiate Philadelphia's offense, and he has been a mixed bag this season. The swing player here, once again, is a wing or guard of your choosing. If the Sixers are going this route, I think it becomes more imperative to search for a wing vs. a guard, because putting another small player on the floor next to Redick and McConnell neutralizes the advantage you want to create by trading for another big wing like Harris. Counting the unknown player here, you've got nine players in the rotation. That's a solid start, and probably requires less maneuvering for this year. What I think you ultimately see when you map it out like this is that the Sixers are in need of guard skills on both ends of the floor. They'll need players who can check opposing one's and two's, and they need to make sure they have players who can help them get the offense going in bench lineups, preferably guys who can shoot. Keep an eye on Wesley Matthews, who team sources continue to insist they're in on, and Corey Brewer, who the team has kept in touch with since his 10-day contract expired early this week. Long-term, the Sixers will hope that Smith can be the fifth man/additional wing in a lot of these lineups. I doubt they will count on him to be that this season, and that all but necessitates a move of some sort to add a player or two to the rotation before the year ends. Boban will almost certainly be a fan favorite, and Brown may end up leaning his way for the backup five minutes over Bolden. I think he's a more situational player, especially in the playoffs where teams will force him to defend in space. But he definitely gives the Sixers a different look to throw at teams and 48 potential minutes of huge, scary men looming in the paint. If the Sixers turn to him at the five, that frees Bolden up to play more power forward minutes, where his three-point shot becomes even more critical. Patton is a player who probably won't get his chance until at least next season. Korkmaz does not defend well enough to play in the playoffs, but he'll probably be needed right now as they try to flesh out the rotation with other moves. Brown has already come out and said that Fultz being part of the rotation would be a pleasant surprise, and I believe the win-now implications of the Harris trade cause discussions surrounding their second-year guard to heat up. A lot seems to be riding on the smaller moves Brand can make now that their core four is in place. The Sixers have the talent to win now, provided they can turn to their bench and not fall into an open manhole.